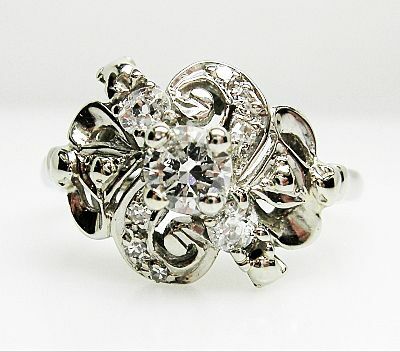 This beautiful vintage 18Kt white gold has 1 round brilliant cut diamond 0.27ct. (colour F-G and clarity VS1); 2 old mine cut diamonds, est. 0.16ct. (colour G-H and clarity SI1-I1); 6 round single cut diamonds, est. 0.04ct (colour H-I and clarity V VS-SI).